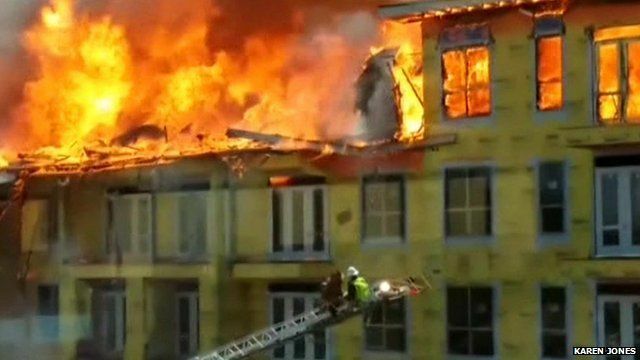 Dramatic escape from building blaze Jump to media player A construction worker has been rescued from a burning building in Houston, Texas moments before it collapsed. Huge Houston apartment building fire Jump to media player A fire has engulfed a large apartment building in Houston, Texas in the US. Crane catches fire and collapses Jump to media player A crane caught fire and collapsed at a Sydney building site at the University of Technology on Tuesday. Thames boat fire 'fear and terror' Jump to media player Emily Farrelly describes her role in the rescue of passengers and crew who had to jump into the River Thames in London after a fire broke out on board an amphibious tourist boat. Knocked off ladder during fire rescue Jump to media player A fireman in Russia has had a remarkable escape after a pile of snow knocked him off his ladder. CCTV of car fire on forecourt Jump to media player CCTV pictures are released of the moment a motorist drove on to a petrol station forecourt in Kent with his car on fire. China water rescue from taxi Jump to media player A taxi driver and a passenger have been rescued from flood waters in south China's Hainan Province where they were stranded. Rescue from flooded bus in China Jump to media player Firefighters have rescued 42 people from a bus submerged in floodwaters in China's Jiangxi province, Chinese state television has reported. A construction worker has been rescued from a burning building in Houston, Texas moments before it collapsed. Footage recorded by an eyewitness shows the man jumping from floor to floor before climbing onto crane. He is then lowered to safety as the top floor of the property crashes down.